When you own hundreds of bottles of good wine, keeping them on a high shelf in a hot closet is not an acceptable option. Lettie Teague searches out the ideal temperature- and humidity-controlled space. I think you may be needing this, said my lawyer to me about seven months ago. She pushed a brochure across her desk. I figured it was something about New York State divorce law, or maybe an article by Dr. Phil on How to Cope with Life After Divorce: "Get real" (Dr. Phil’s favorite two words of advice, applied to everything from weight loss to the end of a marriage). It turned out to be a brochure from a wine-storage company, the Wine Vault. "This place sounds good," my lawyer said. "You should check it out." Never mind I was paying her $350 an hour for this particular piece of advice. My lawyer was right. I had to do something about my wine—most of which was still in the cellar of my former house, with dozens more bottles stuffed into a closet of my new apartment. After years of moving our wines from one unsatisfactory location to another, my husband and I bought an old Victorian whose many attractions included the fact that it was built on rock. This provided not only a great topic for conversation but also excellent natural storage conditions for wine. (The basement stayed about 60 degrees year-round.) Now I had to surrender my piece of the rock and find a place for my two hundred or so bottles. 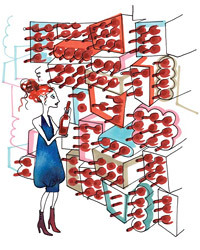 When I mentioned my problem to wine-collector friends, I was surprised by how many of them had storage issues too. Even my friend Scott Manlin, who has more than 6,000 bottles stashed in locations in London and Los Angeles as well as in his home in Chicago, was in search of storage space. "I need walk-in storage space. There is no walk-in storage anywhere in Chicago," he complained. Wasn’t it enough that he had his wine in three different locations? How much more space could he possibly need? "Don’t forget I also have a storage locker in Portland, Oregon," Scott said. "But I just bought 1,500 bottles that I need to put somewhere," he added. Maybe you should stop buying wine for a while, I suggested. "Stop buying? Stop buying? What do you mean stop buying wine? Are you crazy?" Scott exclaimed, his voice rising an octave every time he uttered the word stop. What did I want? I knew I needed a temperature-controlled space of some kind. But a walk-in room or a simple locker? And how much would I have to pay? According to Scott, storage costs $2 per case per month, though I found places that cost a little more and a little less. I needed to decide sooner rather than later because even if my wines weren’t of Scott Manlin quality, they warranted better storage conditions than a closet. A wine-storage facility seemed like the solution; it’s how most people I know keep their wines. My friend Gary, for one, keeps a thousand bottles at Chelsea Wine & Storage in Manhattan. He entertains there as well. As our mutual friend Aimee recounted, Gary invited her to his space one Saturday, where he and a few other collectors opened so many bottles that Aimee was "hung over for two days." Wine storage at Chelsea sounded fun. Maybe it was the right place for my wines. "Call Jason," Gary advised. "Tell him you’re my friend. And maybe some weekend you can come and we’ll open some wine." I told Gary I’d take him up on his offer as soon as I returned from San Francisco. Two of the most innovative storage companies, Vintrust and Vinfolio, are based in San Francisco. Both offer services well beyond storage, the most important of which is cellar appraisal—bar coding wines for insurance or inventory purposes. Both also sell wines, from clients’ collections and their own inventories. Vintrust even provides "sommelier service" from 28 sommeliers around the country. Every Vintrust client is assigned a sommelier, Lisa Minucci, Vintrust’s director of private client services, told me. Even one with only 20 cases, like me? "Of course," Minucci replied. "We have clients who have as little as 50 bottles." But what exactly do the sommeliers do? Do they show up at a client’s house and serve the wine? They could, Minucci allowed, but more often they advise clients on wines to buy and assess their collections. "Perhaps a sommelier could help value your wines," she suggested. I wasn’t sure this was a good idea. I knew what I had, or rather, didn’t have. Besides, the sommelier would probably mock my collection. ("You wouldn’t believe how much nonvintage Champagne she has!" I imagined one Vintrust sommelier telling another.) They’d never do that, Minucci assured me. Really? Even if I had a bad collection? What if I had a cellar full of Silver Oak Cabernet? What would a sommelier say then? "Diversify," she replied. Sommeliers notwithstanding, Vintrust emphasizes storage more than service, claims Stephen Bachmann, CEO and founder of Vintrust’s rival, Vinfolio. "Storage is what Vintrust does," said Bachmann with a bit of a sneer. "We are focused on buying and selling wine. Storage is just a way to attract the customer we want." What sort of wines did they sell? "We can get you literally any wine you’re looking for," Bachmann answered. "If you want 2002 Harlan Estate and it’s not in stock, we can get it for you immediately." He had Harlan Estate "in stock"? "We have connections," Bachmann replied. Both companies seemed impressive, but I wasn’t sure I was their sort of client. (How often did I have an immediate need for a 2002 Harlan Estate?) And besides, I needed a facility closer to home. Even Vintrust’s New York area facility is actually in New Jersey. So I retrieved the brochure my lawyer had given me and made an appointment at the Wine Vault in Mamaroneck, New York. With its monogrammed green awning and discreet doorbell, the Wine Vault looked like an after-hours club. "We started with the idea of a club," said Jonathan Salvador, who showed me around a wood-paneled, windowless room dominated by a wide-screen TV and a wet bar. Were all the members men, by any chance? I wondered aloud, noting the decor. Salvador looked surprised. How did I know? "We have one woman—a real estate agent," he added. I didn’t want to be the club’s second woman, so I decided to give Jason at Chelsea Wine & Storage a call. But by the time Jason and I spoke, he told me there was no room at Chelsea. "I could put you on the waiting list," he offered. A few days later, Gary called to see if I wanted to visit his storage space. I nearly declined. What if I really liked it? I might be even more bitter about being wait- listed. "I was thinking of opening some Hermitage," Gary mused. What time? I replied. I found Gary waiting on the street. "Follow me," he said, opening a metal door and descending a dark flight of stairs to the cellar, where a small group of men (and one woman) were gathered at a table. "You’ve come on the right day; a lot of people are here opening their wines. Even Ben is here," Gary said, pointing to a short man in a baseball cap who was shifting cases nearby. "Ben’s a big Burgundy guy." Ben waved at me. "He comes up from DC just to pet his wines," Gary added as he went off to get a bottle of 1990 Chapoutier Hermitage. I accepted a glass of 1997 Solengo and another of 1999 Domaine Leflaive Les Pucelles from one of the men at the table. They certainly seemed like a sociable group; no wonder there was a waiting list. Meanwhile, I wondered if Scott had found his storage ideal. He had not. But he had another plan—to open his own facility. "I have investors lined up," he said. "We’ll start in Chicago and move into Dallas and Kansas City." What about New York City? I asked hopefully. "No, the market’s saturated," he replied. Months passed. I still hadn’t found a place to store my wine. I talked with my soon-to-be ex. There was no rush for me to move my bottles, he said. And besides, he added, "I’m sure going to miss those wines." Comments? E-mail Lettie Teague at winematters@aexp.com.